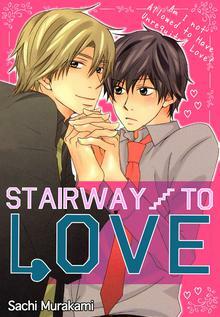 [Free Books] Stairway to Love｜MANGA.CLUB｜Read Free Official Manga Online! Azumi Sasakawa is a proud bottom that has a side job as gay bar bartender. Currently, he only has a casual relationship with Kashima, a handsome interior designer but his interest is actually a patron from neighbor design office, Tomoki Konno. Tomoki was always a bit anti-social and would not even take the same elevator with other customers, moreover, his weak posture invokes Azumi's "motherly" instinct. After an unexpected conversation with the little guy, Azumi assumes Tomoki is cold to him because he is homophobic. Until one night, he met with Tomoki again in Kashima's doorstep... What would happen between these three? "Stairway to Love" is another heartwarming mature "Boys Love" by the fluff goddess Sachi Murakami. It was a sweet read but I don't think the art style or the character personality have really captured my interest. Perfect I absolutely love this manga the characters are super cute and i absolutely adore the art style.